Reprap/Repstrap, what is that again ? Of course, not everyone might know what a reprap/repstrap is : the official site has a very good explanationhere , and the wikipedia article is quite complete aswell . 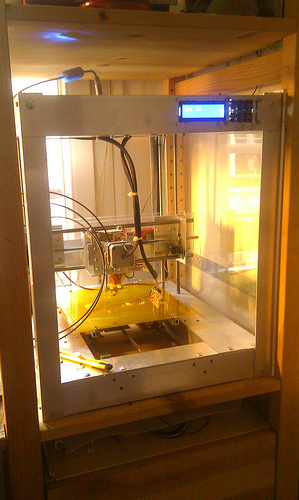 Basically its an open source 3d printer , ie, just like you can print text with a standard printer, with this type of device you can actually print (generally plastic) objects! I could go on for ages about the endless possibilities of such machines , the more you know and think about them, the more you see what they are able to do , even at the relatively early stage in their development, the more amazed you’ll become ! 3d printers have actually existed for quite a while, but they were very expensive , commercial, and closed (as in not open source), they have just become accessible for us mere mortals in the last few years, and their evolution , the different experimentation people are doing with them, are quite staggering. A RepStrap works along the same lines as a Reprap, minus the self replication, and a generally different type of structure/construction, based on more of “build it how you can” basis. Why do you even need such a device? For more and more of my projects, i have been needing specific parts which are either not easily obtainable , too expensive, or simply do not exist (things of my own design etc). The design and construction of the “Doboz” repstrap took many months, went through different redesigns.